It has been a while since I have posted a personal post and I thought this was a good time to catch up on life in the cottage. 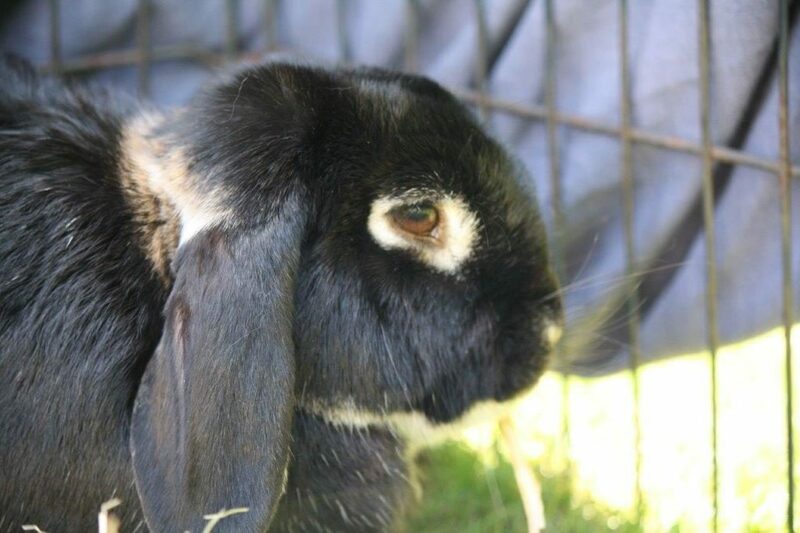 Last week, after eight years, we lost our rabbit Berry. To those of you who found my blog /podcast through Instagram it was probably a surprise that I had rabbits as pets, but to those that have followed me from This is Knit to Ravelry and before, you have shared in the joy, frustrations and tears of us having our bunnies. Er, yes they may be an excuse to fill your screen with bunny images…cough. Berry is my avatar on Ravelry and has been the inspiration for 2 short stories and appeared on Disapproving Rabbits. I really can’t type everything she has been to us in 8 years. She was and still is loved and will be missed deeply. A Cage is Not Enough. I have gotten a lot of questions about having bunnies as pets since posting and I can only say that having a rabbit and having a pet house rabbit are two vastly different things. 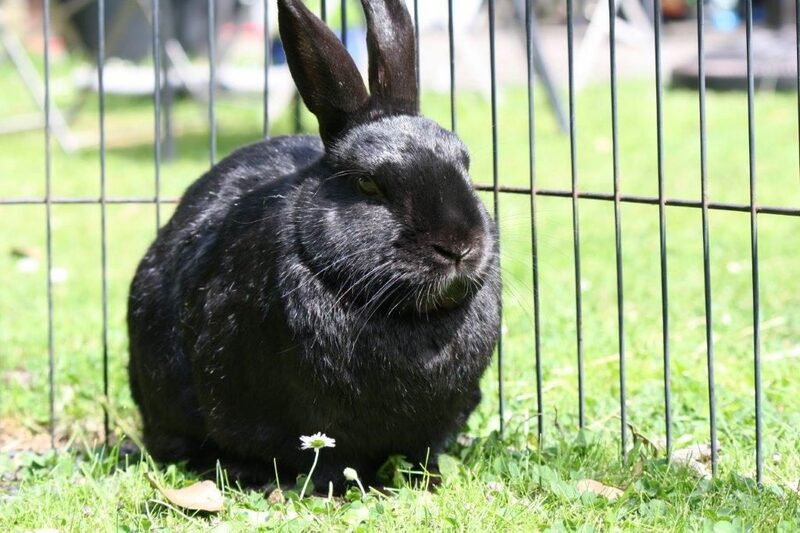 By keeping your rabbit vaccinated, indoors and spayed you are giving it the best chance possible for a long and healthy life(see more here). Rabbits are social. They have their own language and if you want to live in harmony where they do not pee on your pillow, I suggest that you learn it. If you are interested in learning the difference between a binky and an angry shake of the head then pop on over to this website and read it all. Yes, rabbits can be litter trained just like cats. My rabbits have spent 8 years indoors with us and I collect their poop for the garden. Needless to say unlike some people’s thoughts we are not stepping in rabbit poop every ten seconds. 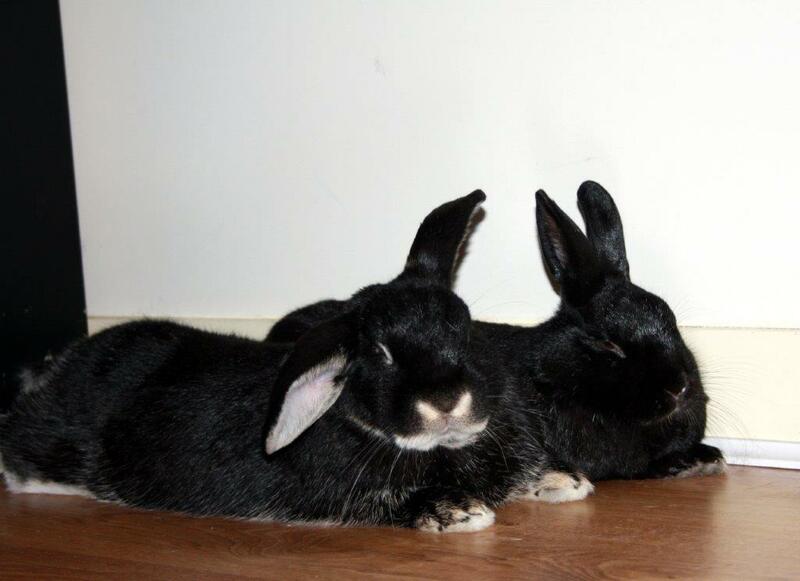 Yes, rabbits poop a lot but we initially trained both Berry and Ninja as soon as they came into our lives. Berry was not yet 1 and Ninja was just 1 year old. We have a dedicated litter tray that fits inside the cage and we placed their droppings in the tray. Usually, a rabbit likes to be clean and will sniff out their poop and poop on top of it. So training can take as little as a day. Some rabbits need work and if you are interested you can read more on the subject here. Our rabbits do to a point share our living space a bit like a cat. They have a huge hay box to dig into and they have as much hay as possible. I still write ‘they’ as opposed to ‘he’ as this post is more about life with both buns. If you think I’m lying I implore you to head on over to the Rabbit Group on Ravelry or House Rabbit society. You may also like to talk to my husband about that time he annoyed Berry so much she went behind the TV and destroy every single cable belonging to him. Not me. Just him. His TV, PlayStation etc. while leaving my Nintendo and DVD player alone. True story or maybe Berry just had good taste. As for the tantrums, well, in their anger bunnies are hilarious. Berry once pulled all the DVD’s out of the tower and flung them around because John wouldn’t give her a piece of his Rich Tea biscuit. She was a lop-eared bunny so each fling of a DVD was met with her ears slapping herself in the face. She still removed every DVD before stamping and huffing in the corner. 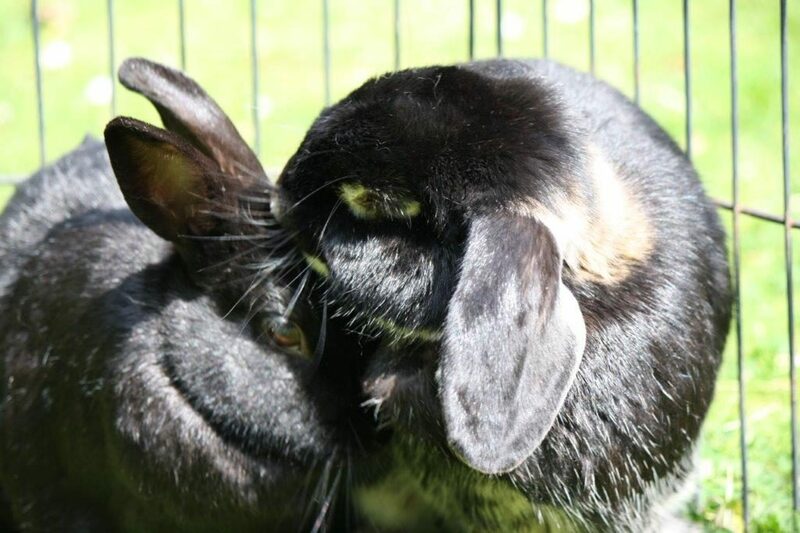 Bunnies love interacting whether they are a solo bun or part of a bonded pair. They have a silent language and they grieve when they lose their mate. When Berry passed away it was tough for us all but Ninja groomed the body and said goodbye to her. He knew she was sick and dying in her final week, giving her space and grooming when allowed, he also did a sort of dance around her body before we removed and buried her. Do I suggest others to take buns as a pet? Bunnies reward you for the effort you put in. I could fill this blog with stories of how we had to deal with Pasteurella and how many months it took Ninja to trust one of us enough to be allowed to groom or touch him. How even now we have to take him to the vet every 6 weeks to have his teeth shaved in his elder years (breed not diet). I’ve had Berry follow me around like a puppy, flop at my feet and give me bunny kisses when I’m sad. I’ve watched her flop out and allow my toddlers to touch her fur and be patient while they tried to pick her up before I reached her. Not all bunnies will allow this, some do the bunny 500 around your house, some like to dig, some chew but all need love and compassion for a long life. Treat them with respect, learn their language and you will have a wonderful pet. Be prepared to be a bunny slave and be prepared for the anger when it comes. They will bring you joy and heartache and no two bunnies are alike. If you rescue a bun be prepared to put in some work and you will be rewarded fiercely. We both miss Berry and when she died I wasn’t prepared for the grief that came with it. Ninja is now enjoying life as a single male, strutting his stuff about the house. You can follow his story over on the Ravelry forums and everything I have had to do in the last two weeks just with the bunnies. Our lives are richer for having Berry and Ninja in it. The house is quieter and I have a little shadow that stays at a safe distance for now, I’ve had to put so much work into gaining his trust over this last week my family think I’m mad but I’m rewarded with nose bumps and I even got a lick yesterday. We have all had those pets that stay with us. That has been there through our tough times and times of joy. That made us a family. We love them and grieve them when they are gone. All we can do is be responsible and give them the best life possible while we are blessed with their presence. I’m convinced that bunnies are here to teach us patience and restraint. Life with bunnies is a whirlwind adventure and I’d rather have joined this ride than never experienced it. My husband on the other hand……well you may just have to ask him! I am so sorry for your loss! We had bunnies when I was little and I loved them dearly. We had one bunny that used to chase my Grandma’s poodle around the houses! Such a funny spunky bunny. They are spirited little animals. Today my husbands voice has been makimg Ninja dive behind the armchair and stamp. My husband speaks and the bunny stamps for quiet. Hilarious! Thank you for sharing this. As a fellow bunny slave, I know too well how hard it is when you lose one. But even though it is painful to lose them it is such a joy to have them be part of the family, I know I wouldn’t want to be without them. It sounds like Ninja (what a fabulous name) is making excellent progress on trusting you. I know it’s not easy to gain their trust, but it is wonderful when they nudge you and ask for attention. Ninja got his name by being ..well..a Ninja 😂 stealthy and speedy you never know where he will turn up. I just miss bunny snuggles because he doesn’t give them.